The Holidays are approaching and Star Dog is doing it's part in making the holidays a joyous time for kids in our area. 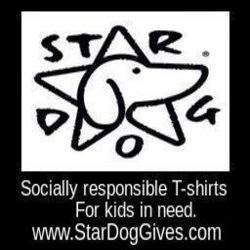 You can help too...Everytime you buy a Star Dog t-shirt we donate one to a child at a local homeless shelter. Go onto www.StarDogGives.com and check out our new selection.